Marital and family law attorney Holly Davidson Schuttler and her husband John have enjoyed a happy marriage for 21 years. Along with balancing her legal career and his investments in real estate, the two professionals have raised two sons, Hunter, a student at Florida State University, and John, a junior at Boca Raton High School. Board certified in marital and family law, and a Supreme Court certified family law mediator, Schuttler is co-founder and managing partner of Schuttler Greenberg & Mullins, LLC in Boca Raton. 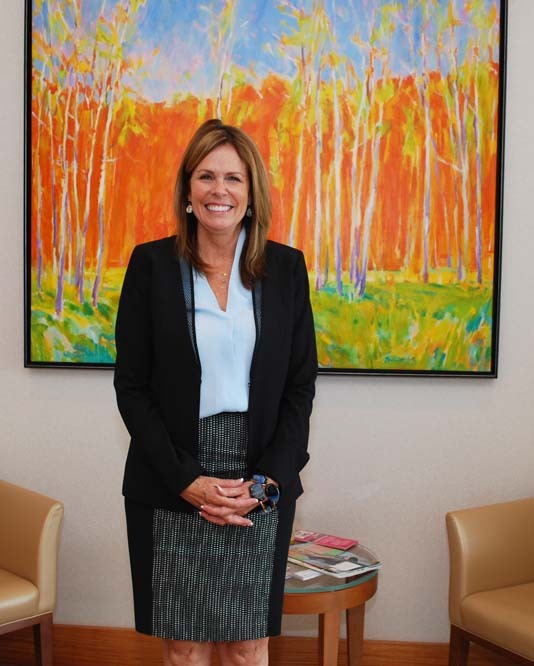 She opened the firm in 2004 with the late Susan Greenberg, and has built a collegial legal team that now includes attorneys Stacey Mullins, Renée Safier Harris and Marissa B. Gart. Schuttler carried that philosophy with her as a college student at The Ohio State University. At 13 she began playing tennis with her father, practiced her skills, played as often as possible and began winning tournaments. At Ohio State she tried out and made the women’s tennis team. In 1984, she visited Miami on her spring break, and decided she preferred the South Florida sunshine to the snows of the Midwest. She enrolled at the University of Miami School of Law, where she enjoyed the moot court competitions. After passing the Florida Bar, Schuttler became an assistant city attorney for Miami Beach, where she advised the planning and zoning board. She also handled high-profile cases, like a lawsuit against Carner-Mason Associates, which had signed an agreement to build and operate a marina on city property but stopped paying rent and had to be evicted in 1986. Next, Schuttler entered private practice, joining Kluger Peretz Kaplan & Berlin and handling commercial litigation matters. But Schuttler found herself handling more divorce and family law matters, and began focusing her practice in that direction. However, alimony remains a contentious issue, and Schuttler is generally opposed to mandatory provisions in the law. “I believe that each family is different, and you have to look at them separately,” she said. Schuttler continues to be active in The Florida Bar, serving on both the grievance committee and the continuing legal education (CLE) committee for marital and family law. In that role, she has organized several telephone seminars to make it easier for practitioners to learn the latest information in the field without having to travel to an in-person meeting. “It’s a quick and efficient way to address many types of CLE topics,” she added.